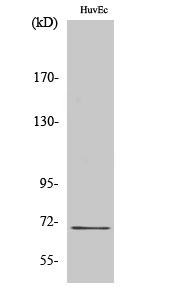 Nrf2 Polyclonal Antibody detects endogenous levels of Nrf2 protein. Synthesized peptide derived from the C-terminal region of human Nrf2. Small volumes of anti-Nrf2 antibody vial(s) may occasionally become entrapped in the seal of the product vial during shipment and storage. If necessary, briefly centrifuge the vial on a tabletop centrifuge to dislodge any liquid in the container`s cap. Certain products may require to ship with dry ice and additional dry ice fee may apply. 1. Lower expression of miR-340 is involved in the development of cisplatin resistance in hepatocellular carcinoma cell line, at least partly due to regulating Nrf2-dependent antioxidant pathway.